If you have not read Part 3a, that's ok. However, I assume you have some knowledge of the apps in this discussion. If you want to go read part a, go ahead. With these three apps, I can do pretty much anything I need. It's not a perfect trifecta of productivity, but it will do. 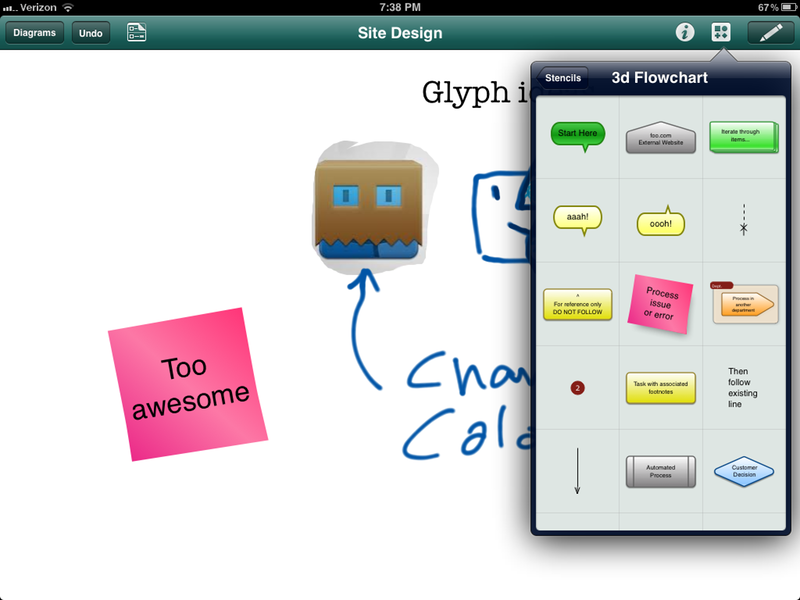 For capturing items from the web, nothing beats slingNote. The main user interface I use is the landscape splitview. In this mode, one half of the display is a browser window and the other half is a notepad (or alternatively, another browser window). 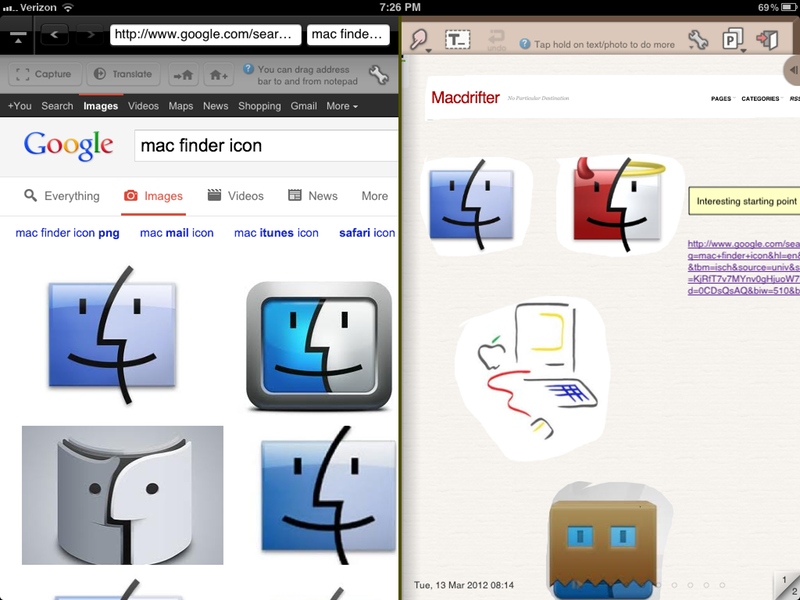 I will do some searches in the browser or open a page from iCab into slingNote. When I find something that I am interested in I activate the slingNote selection tool. At this level, slingNote treats the page as an image and i can lasso any part of the page and drag a copy to the notepad. There are two key features of selections done in this mode. They have the source URL attached as a note to the image. They are just images. Selecting and copying a text block in this way, creates an image of the text block. However, text can be selected in the normal browser mode and copied as plain text. These text blocks can be pasted as usual. slingNote has an interesting UI for object selection. 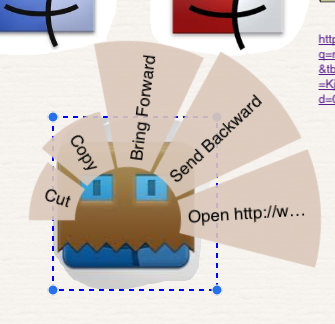 Tap and hold on any object to get a radial menu to copy, delete or even open the source URL. 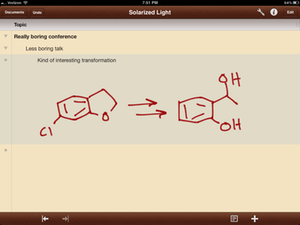 Noteshelf does a good job with basic handwritten notes. The ink is smooth and is not overly processed. My messy handwriting looks about as good as if I was writing on a napkin with a Sharpie marker. Given the accuracy of the iPad multitouch recognition, that's about as good as I would expect from any app. 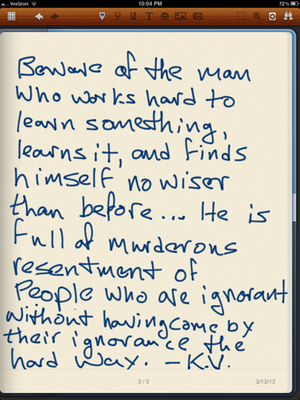 I take most of my typed notes in OmniOutliner. But often, text can not accurately capture a thought. 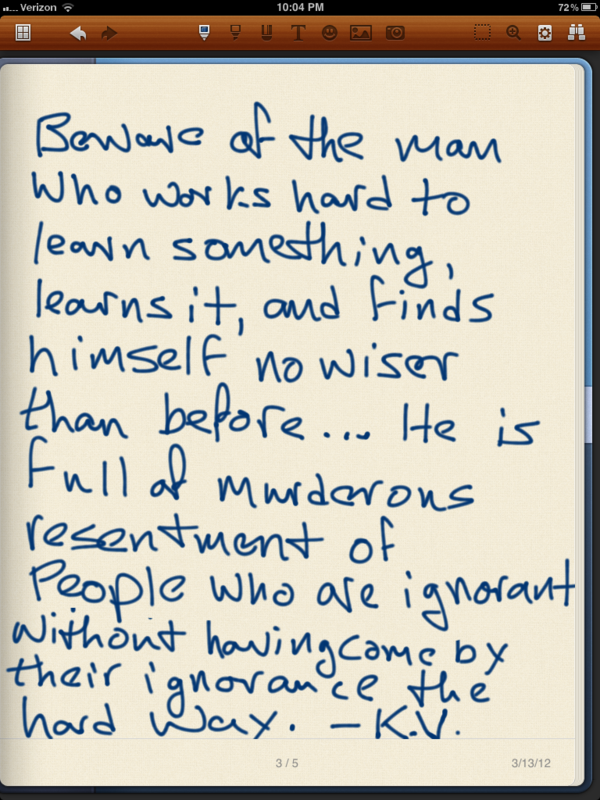 That's when I jump back into Noteshelf. 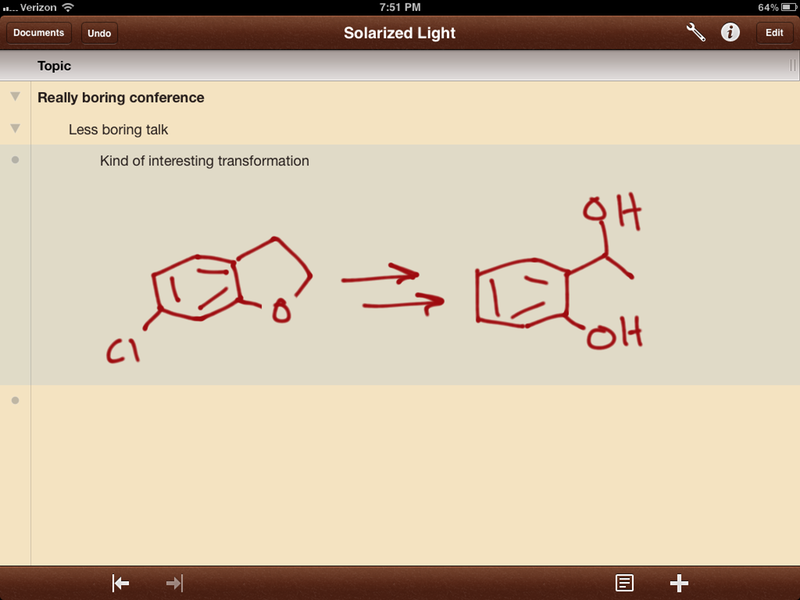 The advantage of Noteshelf and OmniOutliner, is that they play nice together. 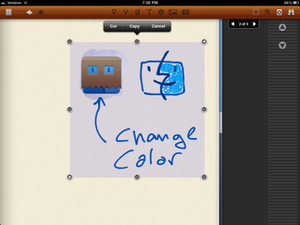 I just copy my sketch out of Noteshelf and paste it right into the OmniOutliner document along with the rest of my notes. I can use slingNote to extract objects from the web (or PDF's) and then paste them into Noteshelf if I want to do some sketching. If I really want to add more detail or complex formatting, I grab the whole thing and put it in OmniGraffle. OmniGraffle provides all of the high-powered formatting tools like image rotations, extensive text formatting and object styling. Additionally, the enormous and ever growing list of OmniGraffle templates means I have access to high quality objects like UI elements and even landscape design objects. I wish OmniGraffle had a better ink system. 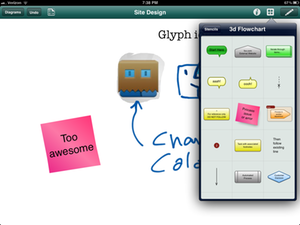 I prefer the OmniGraffle ability to pinch zoom and it options for formatting text and objects. I don't think I would want it to replace slingNote though. That would feel awkward. I'm ok with fast app switching. Anyone that argues iPad does not allow multi-tasking, has never tried. I switch between multiple app effortlessly. 4-Finger swipe back and forth is as easy as ⌘⇥ (CMD-Tab) on my Mac. I'm happy to let each app shine at what they do best, as long as their data can be transported to another app. Right now, this works well for me.